Sustainable intensification has been put forward as a key strategy for agricultural development in Sub-Saharan Africa. This strategy is based on the notion that poverty reduction efforts will only be sustainable if increased agricultural production (i.e. to ensure food security) is accompanied by conservation of natural resources. Soil degradation resulting from the conversion of forest into agricultural lands in the project catchment areas has led to a rapid reduction in soil organic C and N as a result of continuous cultivation, as well as an increase in P adsorption capacity and a reduction in soil nutrient retention and supply. Earlier studies showed that maize grain yield without fertiliser input in the 5-, 10-, and 50-yr-old agricultural catchments was 6.5, 5.5, and 2.5 tonnes per hectare per year, respectively. If this trend continues, farmers living in the area may be forced to migrate. The project catchments are located in Western Kenya and include a forest and agricultural catchments that have been converted from the same forest 5, 10 and 50 years before present. The duration of continuous cropping significantly reduced carbon and nutrient stocks and as a consequence reduced crop productivity. The catchments are in close proximity of less than 3 km (Figure 1) and formed on the same geological substrate, providing ideal conditions for a chronosequence study of watersheds as has been demonstrated for associated plot studies. Figure 1. One set of four watersheds with different periods after deforestation in close proximity to each other (Recha et al., 2012; a second set has been installed adjacent to each other in 2009, see Figure 2). 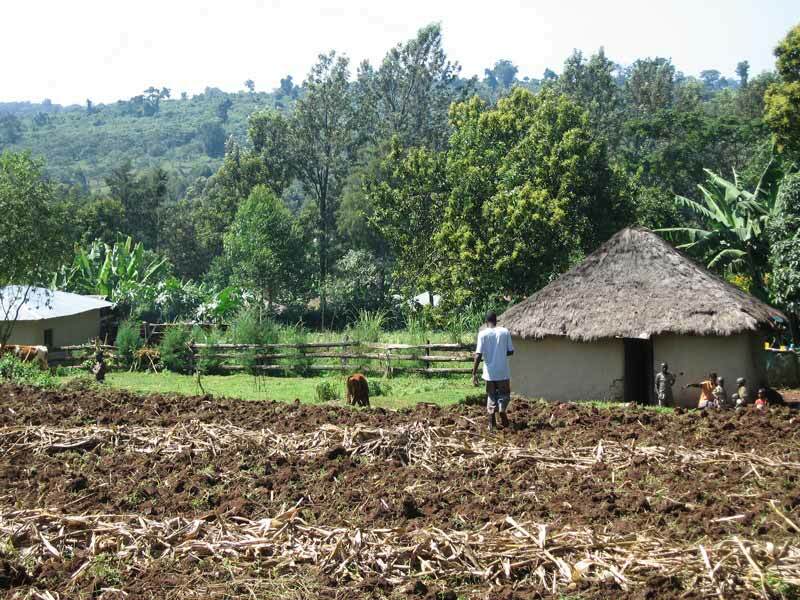 The catchments have mixed land use that includes maize, beans, sugarcane, wood lots, bananas, sorghum, vegetables, tea and millet; nevertheless, the largest land cover consists of maize cultivation (Figure 2). Figure 2. A pair of watersheds in very close proximity with identical landuse history and cropping systems (this example shows two watersheds where the forest has been cleared 50 years ago; Guerena, unpublished data). One watershed will receive biochar applications and the other will not. Seven years of data on carbon and nutrient exports have been collected in two sets of four watersheds, showing dramatic losses of productivity through nutrient fluxes in streams. This provides a unique opportunity to examine the effects of biochar on carbon and nutrient exports on a watershed scale. It seems that this has not been done elsewhere. The World Agroforestry Centre (known as the International Centre for Research in Agroforestry, ICRAF) is an autonomous not-for-profit research institution with a vision of rural transformation in the developing world as smallholder households strategically increase their use of trees, biochar and other sustainable land management practices in agricultural landscapes to improve their livelihoods and forest environmental sustainability. 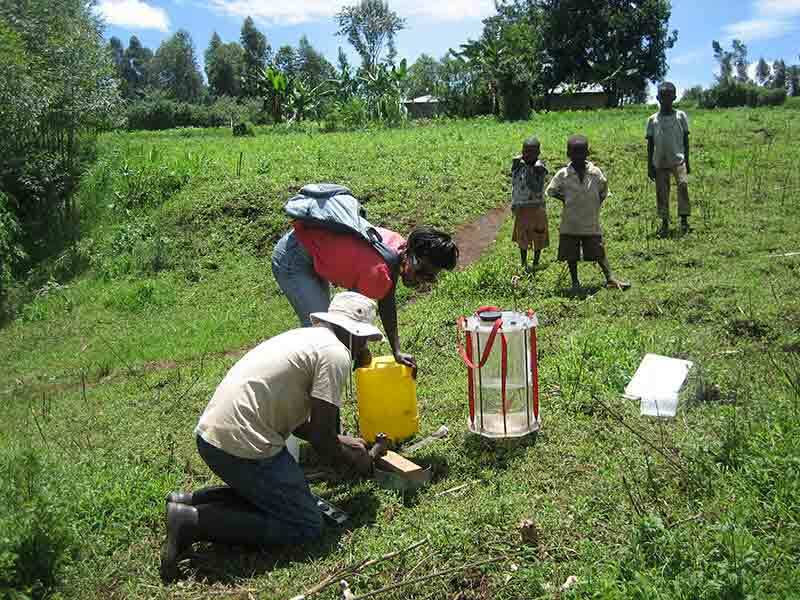 Since 2004, a series of experiments examining the persistence of biochar, its effects on carbon dioxide, methane and nitrous oxide emissions and on soil fertility have been conducted in Western Kenya. 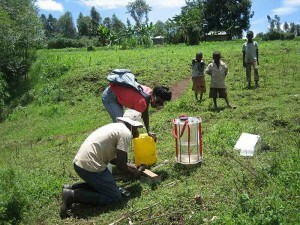 In addition to these focused research activities on biochar effects on soil functions, the group, consisting of academic institutions from Kenya (including the University of Nairobi) and the U.S.A. (including Cornell University), private companies and CG research organisations (including ICRAF), has been instrumental in quantifying life-cycle GHG emissions that include the energy and mass balances of biochar production, biomass procurement and biochar use. These activities are ongoing, and are now including effects of biochar on diseases in beans, and the use of biochar as inoculant carriers (in collaboration with ICRAF). Since 2007, the long-term plot and household trials have been expanded to include watershed trials that assess the changes in soil fertility losses and carbon and nutrient export from headwaters as a result of forest conversion to agriculture for varying lengths of time up to 50 years after deforestation. The selection of agricultural catchments of different ages since conversion from forest provides the opportunity of using existing gradients of degradation to further study the impacts of biochar formulations in reversing the soil productivity decline observed with farm age. 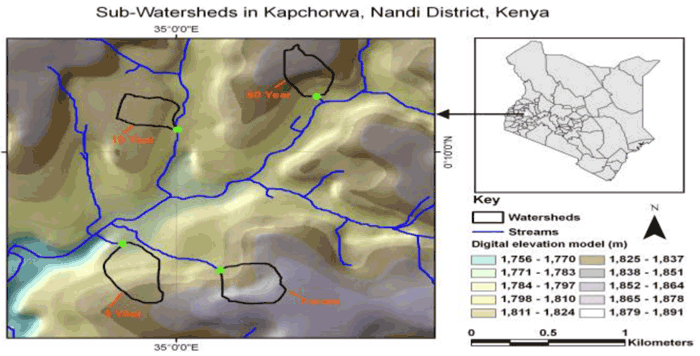 In Kenya, the B4SS project will install the world-wide first watershed study on biochar. Building on seven years of detailed pre-intervention data of water, nutrient and carbon losses by stream water, yield effects, as well as GHG emissions, biochar will be added to one set of four watersheds, while a second set of four watersheds will be kept as a control (paired watershed approach). Farmers’ knowledge of biochar will be initially assessed in all households located in the project catchments using the B4SS baseline survey and monitored at the end of the project on those farmers involved in on-farm experimentation project activities. Biochar will be initially produced from maize residues using kilns that are part of Cornell/ICRAF/University of Nairobi collaborative studies in Western Kenya and used in demonstration plots that will build on previous experimental results. 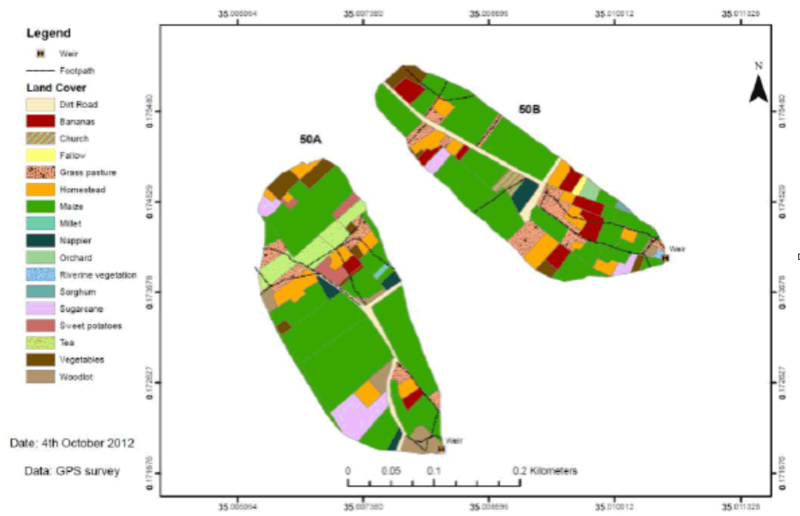 Participatory mapping of soil quality will be conducted to improve our understanding of inherent soil heterogeneity in study watersheds as perceived by farmers using local indicators of soil quality. Soil physical and chemical analyses will be conducted in the lab on soil samples representative of local soil quality classes. This will allow better interpretation of farmer decision making with respect to biochar applications and impacts on soil fertility and crop yield. Participatory trials design (ParTriDes) workshops will be conducted to ensure farmer-driven processes and inclusion of local innovations in the project. The initial proposal is to add biochar on maize-growing areas at a rate of 1 t/ha or less. This will allow monitoring of (i) the export of the biochar itself, (ii) changes in stream water export and occurrences of flash floods that have been found to be related to soil organic matter contents, and (iii) nutrient and carbon retention as well as soil fertility changes on a watershed scale. Building on the InPaC-S participatory methodological approach developed by Barrios et al. (2012) through South-South collaboration between Latin America and Africa, the project in Kenya will develop a capacity building manual that blends local and technical knowledge on soil fertility management thus providing the relevance, credibility and legitimacy dimensions required for adoption of improved sustainable land management practices involving biochar. The ‘training of trainers’ nature of the InPaC-S methodology could provide opportunities to follow a similar participatory process across different country projects. Trials developed during the ParTriDes workshop will be conducted on-farm and replicated on at least 40 sites across the study catchments. The trials will generally include a control (0 NPK or farmer practice), full NPK recommended dose, and biochar formulations applied at different rates. These trials will be strategically located to cover the existing heterogeneity in soil quality. Total biomass and yield at crop harvest will be recorded, and soil organic C and nutrient lab analyses will be conducted before and after application of soil amendments, to monitor the effectiveness of biochar formulations. Based on the results of the biochar trials and insights provided by farmers, a number of recommendations will be discussed among project participants and the steering committee. The most relevant recommendations will be collated in the B4SS good practice guide. The ‘training of trainers’ nature of the capacity building workshops and methodological guide provides the great potential for multiplicative impacts through capacity building provided by teams of best performing trainees. The recognition of the value of local experience and practice during the development of a more robust knowledge base that informs decision makers is a key scalable principle that can be used in any component and level of the agricultural sector. The ability of our participatory methodological approach to foster the integration of local and technical knowledge into ‘hybrid’ knowledge that is relevant, credible and legitimate, would be an asset during scaling up processes. It is anticipated that the development of local innovation platforms linked to the biochar demonstration sites established during the implementation of the B4SS project will be a promising tool to foster dissemination of results and local experimentation. Information dissemination and knowledge sharing as part of the farmer decision making support process will also benefit from parallel research projects in the area that explore the effects of biochar on diseases in beans and the evaluation of the use of biochar as inoculant carriers or as means to promote beneficial microorganisms in soil. Increased awareness and improved understanding amongst smallholders, including women’s farming groups, and resource managers on the use of biochar to address soil constraints, and most effective application rates and formulations (e.g. mix with other organic and mineral amendments) to achieve agronomic benefits and minimise nutrient losses, will be key outcomes of the project in Kenya. It is unknown if a similar experiment exists and it is unlikely that a study that includes duration of cropping and biochar additions in a paired watershed approach with seven years of detailed pre-intervention stream and soil monitoring will be easily available in any other location. This unique feature of the B4SS project will provide a basis for critically needed data on a meaningful scale.